Let this be the year you finally build a proper home bar. Where should you start? Well, you know you’ll need booze, a few mixers and fun garnishes but to get you on the right track we’ve selected a few infographics that break down the basics of stocking a home bar. Whether you want to go all out and splurge on a full-sized bar or have just enough space for a bar cart this guide will make your boozy dreams come true. Take inventory and see how many of these basics you already have in your home. Missing something? Shopping for it is half the fun! Although this infographic focuses on stocking a bar cart the same tips could be applied to a mini bar. You'll find great ideas for storage, as well as a list of bar equipment, glasses and extras. Don't forget your bar supplies! 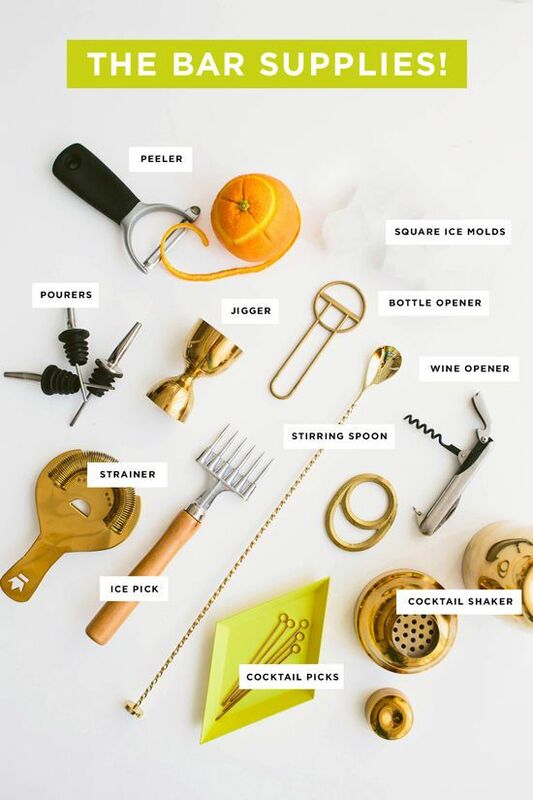 You'll need classics like a jigger and a stirring spoon but also a zester, ice molds and elegant cocktail picks. Add a little fun to your home bar with extras like stylish trays, patterned bowls, fancy straws and colorful napkins. Get cocktail recipes! Of course you want to enjoy the fruits of your labor so here are 13 awesome cocktail recipes to get you started.